Missing from the round up of European Sporting Rifles was the rifle I actually bought with my own money, the SR30 by Heym. Which in case you were wondering rhymes with rhyme. Due to its inexplicable place far from the firmament of fashion this is; a handmade rifle you can still buy, preloved, for a lot less than the price of something plasticy and mass produced. A by-word for old-school german engineering, Heym are famous for their; dangerous game rifles with stout Mauser actions. Their safari double rifles in calibers beginning with a 4 or a 5, and the SR21 a very nice iteration of the european sporting rifle theme, available in grades from 'working' to 'oligarch's heirloom'. Just like at the office, sometimes even the most conservative of characters can have an unexpected quirky side to them, so just because they could - Heym took the Fortner action of biathlon fame and scaled it up to centerfire dimensions. From the first time I saw one on a trip to that english institution Holt's Auction I knew I'd get one later if not sooner. The design does away with bolt lugs as we know them, or even Blaser's radial collets, and instead uses six ball bearings to lock up, making for an immensely strong straight pull action, that gives you a rapid second shot at that rampaging boar. The bearings might look diminutive, Heym have successfully tested the system at 110,000psi pressure, which is, give or take, double the 55,000psi pressure of a typical rifle cartridge. Picture found online, I'm not taking my bolt apart, not sure I'd be a able to get it back together. 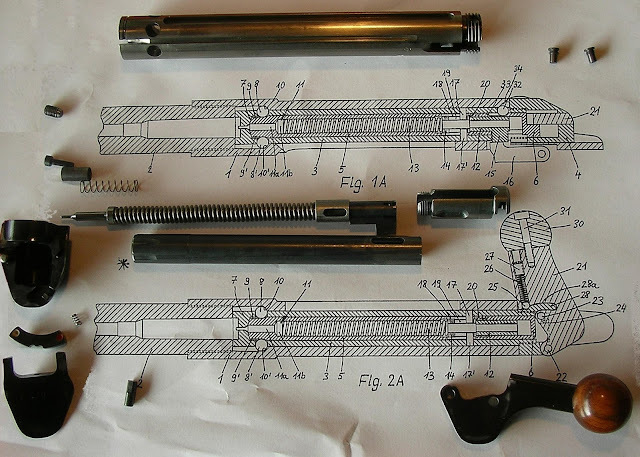 In Germany I'm told the rules state that you can't stalk with a cocked rifle, blocking the firing pin isn't safety enough, which lead to the de-cocking actions of several german brands. Here Heym excel themselves. As you push the bolt forward a seventh ball bearing on the side of the bolt snicks into place, acting on a shaft which pops the six radial bearings into their an indent, the rifle is now fully closed but still not cocked, slide the wooden-ball bolt handle that last few millimetres forward to arm the rifle. Pulled all the way back & under tension, with the bolt release disengaged - the bolt can slide free of the action. The red and white tabs of the Cross Bolt system act as a second safety, allowing you to lock the action open or closed. When locked in the open position the bolt has absolutely minimal contact with the race way and can fall to closed under gravity. Nice slim woodwork, rosewood snout on the fore end, bolt handle, and cap on the pistol grip. All checkering cut by hand. Laminate, thumbhole (with or without adjustable cheekpiece), GRS Hunter, and a petite 'Dezima' are all factory options. I was on the verge of ordering a new stock but this one is an adjustable cheek piece away from ideal and I kind of like the fact that its got a few dings; I'm tough on stuff, and the first scratch I put on the new one would kill me. Cold forged barrels, made in house, proven in competition everywhere north of Oberstdorf. My barrel dosen't seem to like PPU or 100gr bullets, 75gr it likes a lot more, but my start point for load development will be 68gr - if you've got anything meaningful to add leave a comment. Heym's own trigger, super crisp at [a guess] not far beyond a kilo [2.2 lbs] with a single set-trigger function breaking a useful distance north of terrifying. I like the idea of set triggers more than the actuality. heym have gone for useful rather than 'keeps you regular'. Please Note: The Suburban Bushwacker DOES NOT endorse the use of PPU brand ammunition. I've never owned a Heym. But have shot one whilst out in pursuit of scotish roe. A good friend ( now sadly pasted on ) had one in .222. I witnessed him use its set trigger too perfection off the bonnet of his little susuki jeep on a 300+ yard running fox early one morning. PPU make rather good ammunition at a very affordable price. IIRU they use to make brass for a number of the european branded ammunition manufacturers. Er yeas, my taste in women would seem to back that observation up.